The tiny house movement is slowly taking over mainstream millennial living. What used to be our parent’s vacation getaway is now an option for a permanent dwelling… mortgage free! 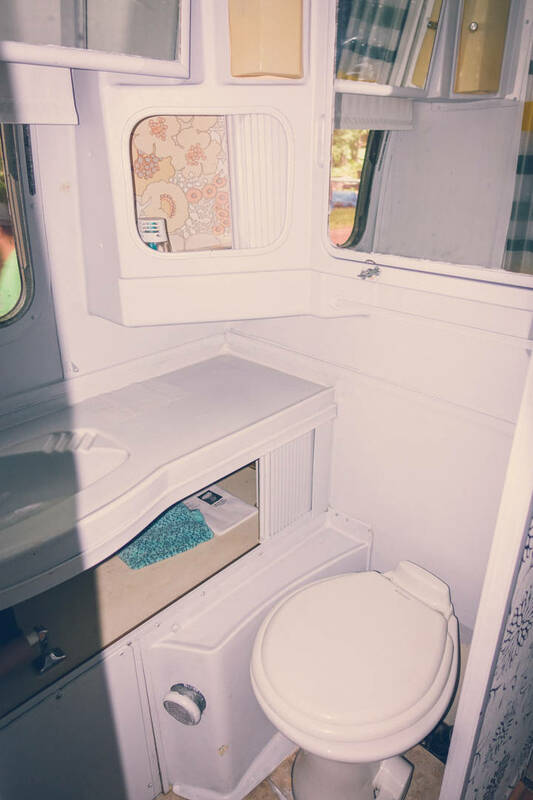 Nowadays, with so many wheeled-houses to choose from, it’s easy to find the right one for you: tiny houses, fifth wheels, teardrops, Airstreams, RVs, pop-ups, take your pick. 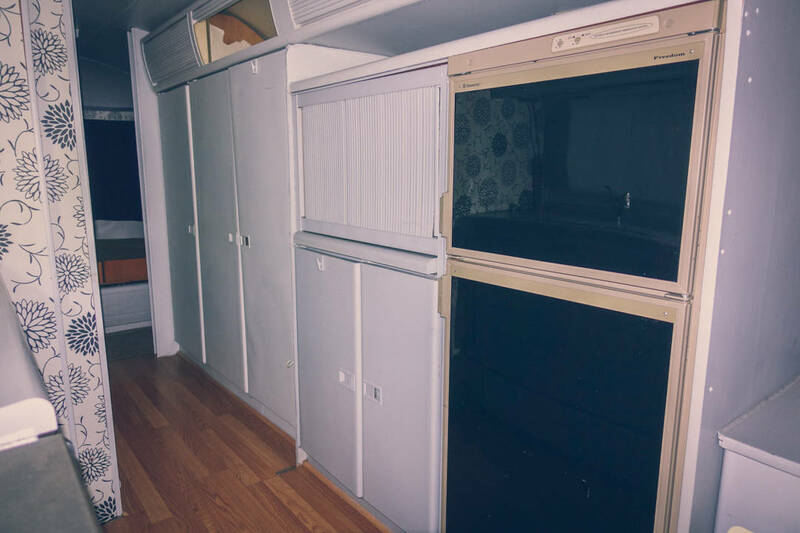 We picked up a 31ft 1976 Aistream Sovereign Land Yacht for $13,000 CAD (cheaper than a year of rent in Toronto). Airstreams are the Cadillac of trailer living; brand new, these aluminum apartments go for up to $160k! Our frugal budget is $40k, which leaves us $27k to upgrade 1976 to 2016. 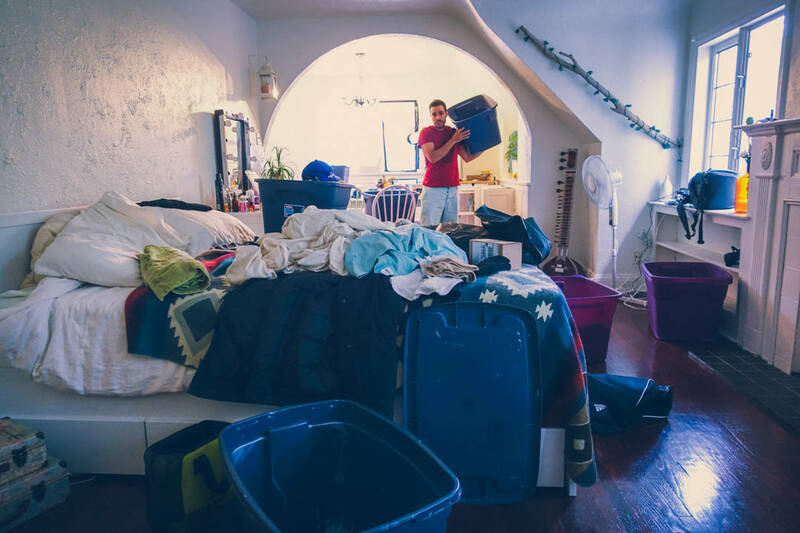 As the gutting begins, the problems pop up like kernels on the stove. What did we get ourselves into? 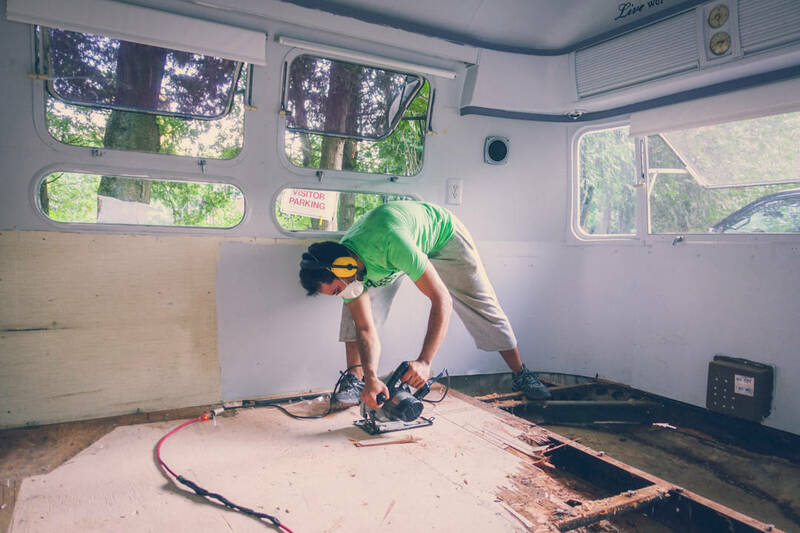 We aren’t renovators, trades-people, and we don’t know squat about trailers. Despite all the questions we have, we aren’t questioning our new lifestyle choice. 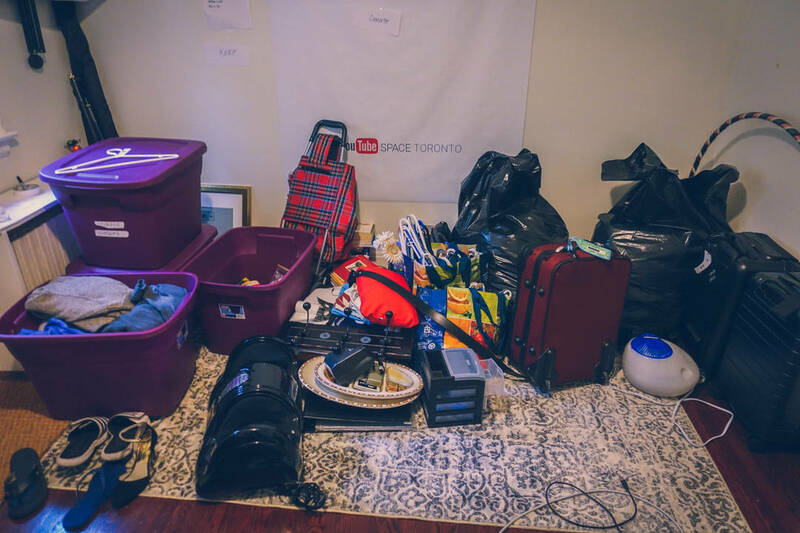 The first step was packing up all our stuff! We had A LOT of stuff. 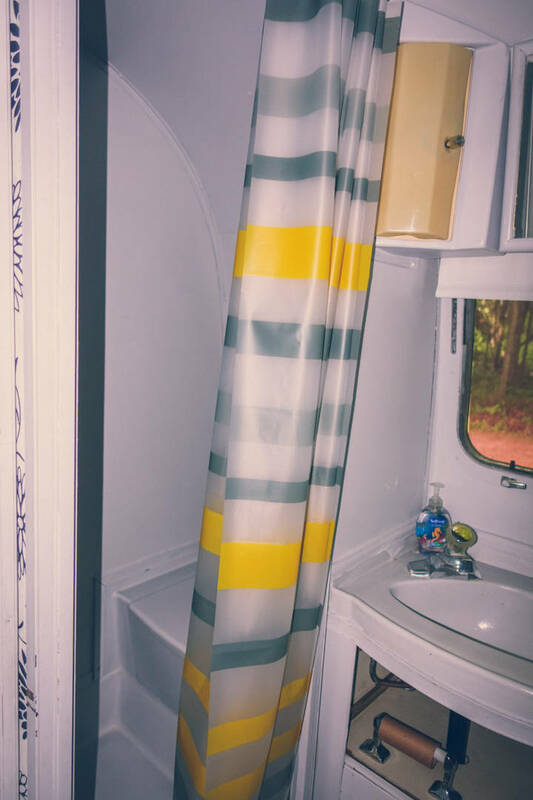 Our Airstream (she is currently nameless) needs to be retrofitted to our lifestyle: a mobile office, charming home and functional studio space for filming YouTube videos. As travel videographers, we spend half our time on planes, in hotels and going on wild adventures (I’m currently writing this on a flight to Thailand). Kristen and I have explored the world on foot, camel back, motorcycles, flippers and hot air balloons. Now we want to explore Canada and US with a windshield and a snail shell. How often did we wish we had new neighbours or a different yard? Now, those changes are literally a turn-key away. The bathroom before any renovations. “Live wel” might have to go. This new lifestyle is a long-term plan. We want this “sardine can” to be our dream home. It will be a space to grow our businesses, a vessel to travel with friends and a home to start a family. Surprisingly, tons of people are raising and home schooling one, two, three and even four kids in the same size trailer as ours. Kids are natural born explorers, making up daring tales of escapades and mystery. Remember when your parents’ living room carpet turned into lava? Now put your childhood imagination in the Red Woods forest of California or watching the Northern Lights in Yukon. Road trips have all the ingredients to cook up creativity. This exciting new lifestyle change doesn’t come without worry. Even now the thought of crashing at families and friends houses until our airstream is renovated is a little daunting. I haven’t actually realized that we are “homeless” until this moment. Woah! Yes, it’s a radical change from our cozy apartment on a subway line in Toronto. Yes, I have concerns about unknown issues that will arise on the road. Yet, I have never felt more free in my life. Previous Post WIN a TRIP for 2 to THAILAND! There is one thing i have got to know about life in general. You do not have a Tory to tell without giving a shot at something. This is such an inspiring story for me. They were able to accept the challenge and work on making things better. What most people do is sit back, see the negatives and pull back. I’m glad you didn’t give up. 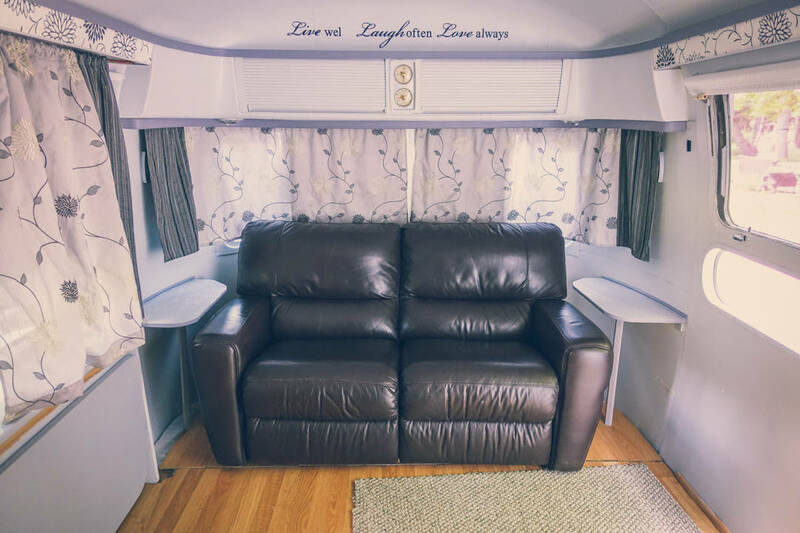 I heard about your B/vlogging of your Airstream Reno experience through my friend Essa Bowser (wife of Andrew Huang). I’m glad I checked out your channel! You guys are awesome! My husband and I just bought a 1971 Airstream Soverign Land Yacht. Same lay out but mirror image. She is sitting in our driveway half gutted, and we are going through the same experience of finding nasty surprises in the walls and such. It will be a long process to restore it, and we too plan to travel our beautiful country/continent with it for the next many years! i look forward to your next update. Keep it real! Thanks for sharing, I love the videos! 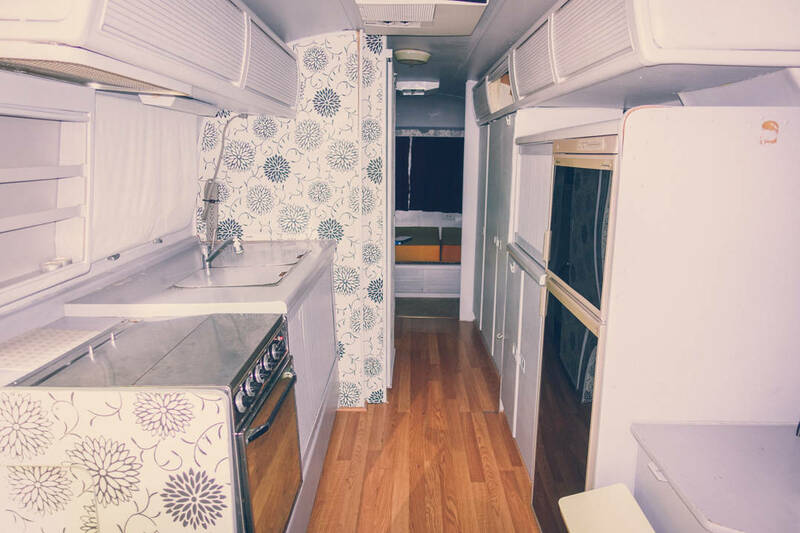 What was the outcome of your airstream dreams? 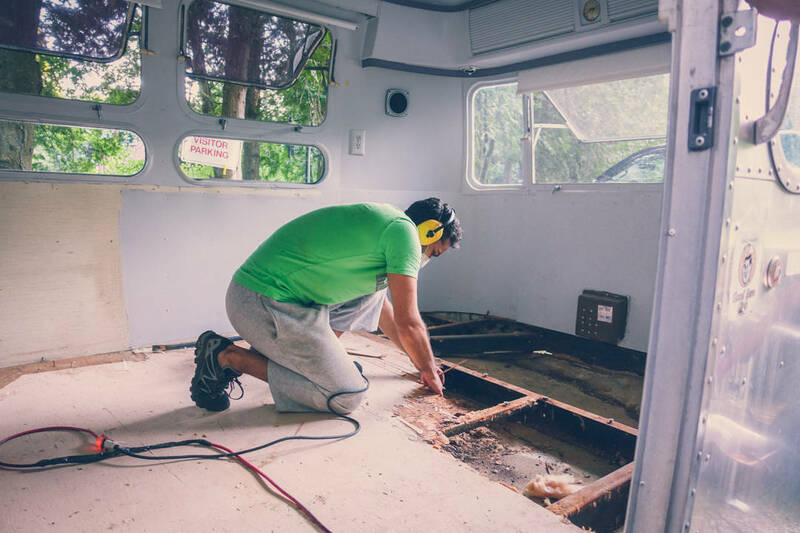 Hey Darryl, our Airstream is currently getting renovated. 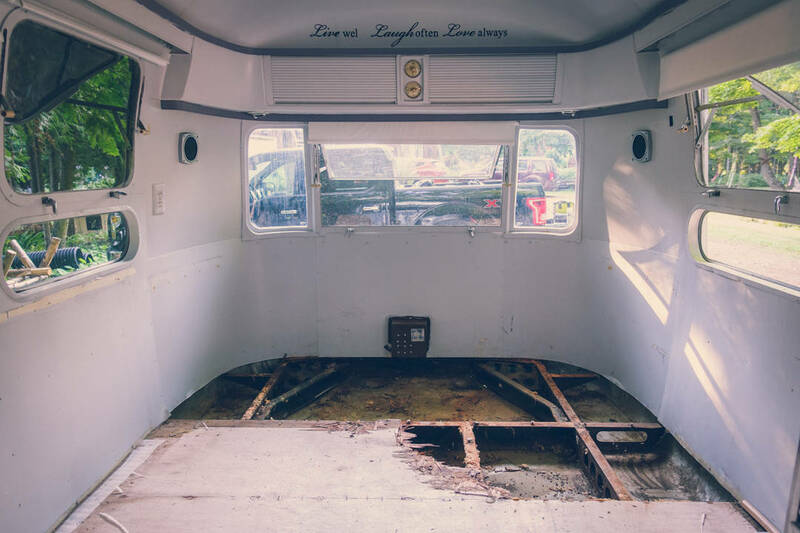 You can check out our most recently video and post here: http://hopscotchtheglobe.com/renovating-our-1976-airstream-sovereign/ She will be ready on July 1st! Yeah! We’re definitely looking forward to some amazing road trips in our new home! You guys! This is awesome. I love your enthusiasm in your video. I can’t wait to follow you on your adventures! We’re really looking forward to this next HUGE adventure! Thanks for following along – updates coming soon! guys, I’m officially really really jealous. And we’re terrified! Hahah and really really excited! My friends traveling the US for a long time now with their 2 kids in a caravan.